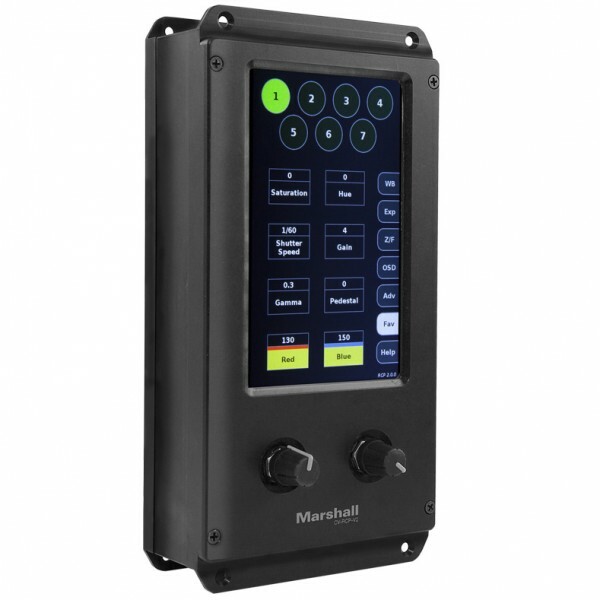 Product information "Marshall Touchscreen Remote Control for up to 7 Cameras CV-RCP-V2"
New larger 5-inch TFT LCD Touchscreen (800x480) with fine-tune adjustment knobs. Directly adjust and match up to seven different cameras from the convenience of control truck or control booth. Common 3-pin XLR cable connection allows for cable-runs at distances of up to 300 meters (1,000 ft). Adjustments made on camera without OSD Menu appearing on video stream. The touchscreen interface offers self-help dialogs, favorites settings, save features, and intelligent menu and sub-menu layouts. The fine-tune finger dials enable precise adjustments for white balance, red/blue gain, gamma, black level, brightness, exposure, iris, shutter, resolution, frame-rate, and more, and they can be adjusted simultaneously or one at a time. The CV-RCP-V2 comes pre-programmed with control protocols for all Marshall Cameras, including Marshall's POV cameras, varifocal cameras, zoom cameras, PTZ cameras, as well as other popular non-Marshall branded cameras on the market. Related links to "Marshall Touchscreen Remote Control for up to 7 Cameras CV-RCP-V2"
Our comment on "Marshall Touchscreen Remote Control for up to 7 Cameras CV-RCP-V2"
Customer evaluation for "Marshall Touchscreen Remote Control for up to 7 Cameras CV-RCP-V2"